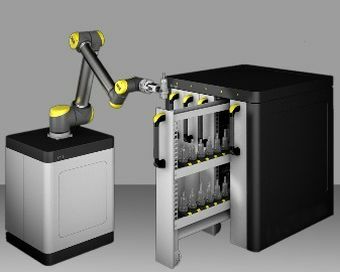 The ZOLLER "Cora" collaborative robotic assistant supports manufacturers in all standard tasks for tool preparation. The machine can pick, assemble, clamp, clean, label and position your tools fully automatically. Thanks to its integration to the Z.one tool database, Cora knows exactly where your tools go. With its double gripper, components and tool assemblies can be securely gripped and positioned, either in the tool presetter, Smart Cabinets, or on the tool cart. Integrated to the ZOLLER Z.one tool database and TMS Tool Management Solutions, Cora knows the precise location of your assemblies and components. For instance, Cora can open ZOLLER Smart Cabinets, such as the "keeper," remove an assembled tool, insert it into your presetting and measuring machine, and start the measurement process, simply and quickly with very minimal programming effort. After opening or closing the cabinet, Cora is swiveled 90° and doesn't interfere with tool handling.